Germfree Laboratories, Inc. was founded in the United States in 1962, to manufacture isolators for gnotobiotic or ‘germfree’ research. 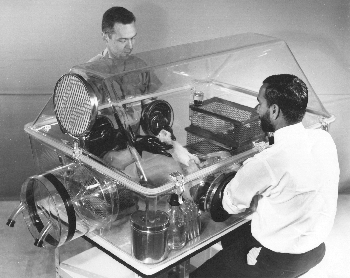 In the 1970’s Germfree added additional lines of biosafety equipment to include the Class II and Class III Biological Safety Cabinets. In the 1980’s we added laminar flow cleanroom equipment for hospital pharmacy and radiopharmaceutical IV compounding. Germfree has delivered aseptic and hazardous drug compounding systems to 40% of the hospital pharmacies in the US with units also being shipped globally. We have built a reputation for engineering and manufacturing durable and reliable products. Germfree currently maintains units that have been in continuous operation for over 40 years. Our isolators and laminar flow technology is utilized by many of the top 10 Pharmaceutical and Biotech firms for production and lab applications. Germfree provides custom specialty systems for applications where the standard ‘commercial off the shelf’ (COTS) product offerings are not suitable. This includes custom size, low profile equipment fabricated with 316L stainless steel as well as explosion-proof options. In addition to products for aseptic processing, Germfree is recognized as the global leader in providing Class III Biological Safety Cabinets (Gloveboxes) for BSL-3 and BSL-4 high containment laboratories. Germfree’s systems are used to meet the rigorous standards for complex biocontainment applications such as early stage vaccine development. Our units operate at many of the US Government’s most technologically advanced and secure BSL-3 and BSL-4 laboratories, including: The United States Army Medical Research Institute of Infectious Disease (USAMRIID), the National Institute of Allergy and Infectious Disease (NIAID) and the National Biodefense Analysis and Countermeasures Center (NBACC). Over the past 16 years, Germfree expanded its operations to develop and implement ground-breaking technology, paving the way for new mobile and modular laboratory systems. In 1999, Germfree entered this arena, collaborating with the US Army at ECBC (Edgewood Chemical and Biological Center) to design ruggedized Class III BSCs and Biological & Chemical Filtration systems. Germfree continued to innovate new technologies through the CRADA (Cooperative Research and Development Agreements) program. We have participated in multiple cooperative research agreements with the US Army and developed a complete line of primary containment equipment for mobile labs which include: Class III BSC (Gloveboxes), Class II Biosafety Cabinets, Fume Hoods and corresponding exhaust air filtration. The design and manufacturing techniques are engineered to withstand the rough handling expected of a piece of military equipment. We manufacture mobile units in a variety of platforms including vans, trucks and trailers. They allow for extended field deployments in remote global locations and are air-transportable (C-130). This expertise gained from numerous military mobile projects was further advanced in 2007 with the development of our modular laboratories. Germfree has demonstrated international expertise in providing BSL-3 labs built into ISO containers and modular buildings. We have placed fully commissioned CDC-NIH compliant BSL-3 facilities globally, including installations in remote locations in Asia, Africa, the Caribbean and South America. Combining our Mobile/Modular Laboratory experience with our expertise in engineering controls, we expanded our offerings to include Mobile/Modular Cleanrooms that meet both FDA cGMP compliance and USP 797/800 drug compounding requirements. Germfree also integrates containment systems according to the biocontainment guidelines of the CDC-NIH BMBL to meet the demands of any hazardous Biopharmaceutical process. Our facilities are fully commissioned, pre-qualified and Factory Acceptance Tested (FAT) with complete IQ/OQ documentation. The biopharmaceutical industry is implementing new methods for the broadening pipeline of emerging therapies. There is a call for specialized and flexible cGMP-compliant space. Many biopharma applications simply require small-scale, preclinical process areas and cleanrooms. For biotech startups, readily available facilities are an ideal solution for the early stages of drug development. Biopharmaceutical companies also benefit from bioprocessing space that can be repurposed as production is ramped up to later phases. To meet these demands Germfree developed its line of BioGO™ Mobile and Modular Adaptive Bioproduction Suites. All aspects of a project are done in-house. Our leading-edge fabrication technology, engineering teams and subject-matter experts are located at our 173,000 square foot (16,000 square meter) environmentally controlled US manufacturing plant. Germfree provides a single-source OEM solution. This allows our mobile, modular and cleanroom projects to be operational in a fraction of the time required for traditional construction.